This Halloween, show off your fashionable style wrapped in the Underwraps Little Boy’s Skeleton Suit Costume. Get the perfect costume that your little boy will love this year. He won’t want to take it off! A sleek and fashionable black suit printed with almost all of the body’s bones. Features a jacket with a shawl collar and center-front buttons with a printed rib cage & arm bones on the front & sleeves. The pants have an elastic waist with printed pelvis & leg bones on the front. The shirt front fastens with Velcro at back of the neck and has sewn-on pre-tied necktie. Gloves have printed hand bones on backs. Known for its distinctive designs and versatile trim, Underwraps Costumes delivers high-quality apparel for your desired costume ideas. Since its inception, Underwraps Costumes has established itself as a benchmark for quality and value with a product line of over 1200 styles. Look for unique and unforgettable Halloween costumes for women with Underwraps Costumes! Made of 100% lightweight, breathable high-quality polyester poplin fabric. Hand wash in cold water. Line Dry. Do not iron or bleach. Children’s size medium. 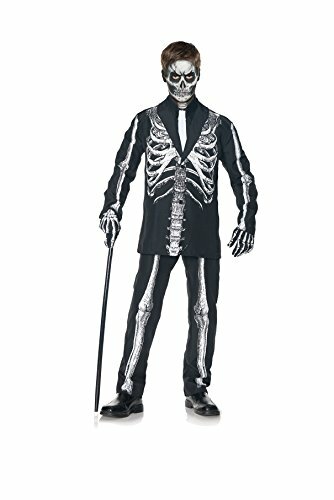 STYLISH SKELETON: Get the perfect costume that your little boy will love this year. He won't want to take it off! A sleek and fashionable black suit printed with almost all of the body's bones. SUPER DESIGN: Features a complete printed skeleton for a unique design. Jacket offers a shawl collar with center-front buttons. Shirtfront fastens with Velcro at the back of neck. MULTI PURPOSE: Ideal for Halloween parties, stage and theatrical performances, costume parties, holiday productions, festivities, and many other dress-up occasions. QUALITY & VALUE: Known for its distinctive designs and versatile trim, Underwraps Costumes delivers high-quality apparel for your favorite costume ideas. Get unique and unforgettable looks! SPECIFICATIONS: Made of 100% lightweight, breathable high-quality polyester poplin fabric. Hand wash in cold water. Line Dry. Do not iron or bleach. Children's size Medium. If you have any questions about this product by Underwraps, contact us by completing and submitting the form below. If you are looking for a specif part number, please include it with your message.